As one of the lead characters keeps reminding you, the Devil is in the details. And Badla, at its very core, is all about details. Small, niggling, conniving details which, for better or worse, keep the viewer interested for the vast majority of the film. Director Sujay Ghosh is not unfamiliar with the thriller genre, having delivered a genuinely intriguing movie in Kahaani before. Badla, inspired by the Spanish film Contratiempo (The Invisible Guest), is another whodunit that is all about revenge. Interesting quirks like using the Mahabharatha to draw parallels are what set it apart from the original. Badla is set in Scotland, and revolves around a woman who is found with her dead lover in a hotel room, with seemingly no exits and/or external involvement. The woman, Naina Sethi (Tapsee Pannu), hires a lawyer called Badal Gupta (Amitabh Bachchan) to help prove her innocence. Gupta has been convinced by Sethi's legal counsel Jimmy Punjabi (Manav Kaul) to come out of retirement to handle one last case. A majority of the movie involves the exchanges between Sethi and Gupta, with the lawyer trying to extract the truth from his charge (he is an expert on witness preparation) to work out how to defend her against a seemingly open-and-shut case. The movie is paced very well, especially pre-interval, as flashbacks convey Naina's version of that fateful day. The story is unravelled layer by layer as time progresses, as Gupta presses for the truth ("and only the truth") from Sethi. A three-hour deadline due to the imminent declaration of a surprise witness adds even more urgency to their preparation, and things reach boiling point by the end of the movie. There is more than what meets the eye, for both the major characters. Director Ghosh and cinematographer Avik Mukhopadhyay present a stunningly brooding Scottish setting, with sharp outdoor scenes and heavy close-ups during the lead characters' exchanges. The script is well-done, and provides plenty of twists and turns throughout the two-hour narrative. An important element of the story is the murder scene flashback, which keeps repeating but with various added details as the viewer comes to know more, and is the primary device that is used to keep the tension alive. The complete lack of melodrama and any song/dance routines mean that the movie never loses its focus, and keeps you continuously involved. The details are very finely presented, to the point of over-explaining them in some cases. Badla's primary problem is one that has plagued Bollywood movies set in foreign countries for quite some time - Hindi-speaking Indian side-characters (especially officials, like the police) that appear out of the blue very conveniently. It reduces the immersion, and you would expect slightly better handling of that issue. Also, despite its intensity, Badla is not as deep as it wants to be, and the ending is fairly apparent just a few minutes into the second half. It is not really an indication of the film's watchability, but it certainly reduces the experience for a crime/thriller junkie. 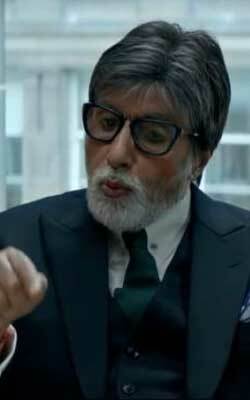 Amitabh Bachchan delivers the dependable performance one expects from him. If anything, his deep baritone takes command of every scene he is in, sometimes a little too much. Tapsee Pannu has worked with Bachchan in Pink previously, which appears to make her more comfortable in his presence, but she still looks a little outmatched (not entirely her fault, we know - Bachchan tends to tower over most actors). Amrita Singh is back on screen after a brief hiatus, and is very convincing as the grieving mother. Tony Luke seems more at ease playing the hunted than the hunter, but does a decent job nevertheless. Manav Kaul as Naina's legal counsel has a small role, but looks assured. The sound plays a very important role in holding up suspense, and Badla manages to pull that off without any hitches. The complete lack of any songs or dance sequences also helps to uphold the sombre mood set by the film from minute one. Tennis great Arthur Ashe once said, "Success is a journey, not a destination. The doing is often more important than the outcome." Badla, despite its predictability, is a very tightly directed thriller, and manages to both capture your attention from the get-go and hold onto that even when it becomes apparent what the ending is going to be - no mean feat. It may not have you thinking after you get out of the theatre, but is a fairly good ride for as long as it lasts. Be the first to comment on Badla! Just use the simple form below. fullhyd.com has 700,000+ monthly visits. Tell Hyderabad what you feel about Badla!